Based out of Moldova, Cactus VPN is a relatively small-scale operation by Virtual Private Network standards, but has developed a strong reputation. As with other VPN providers, it offers encryption, IP masking and a means of working around geographical restrictions, giving users complete privacy, increased security and more online freedom. 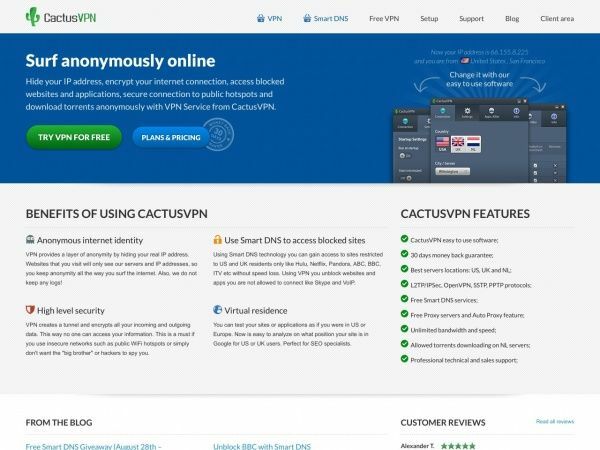 For potential customers who are unsure as to whether or not they wish to subscribe to the service, Cactus VPN offers a completely free one-day trial. Users are able to make use of their trial account for a total of 24 hours from sign up, and no credit card details or other payment information needs to be provided in order to gain access. After registering for a trial account, it is recommended that customers install the client software onto their device. The trial comes with no commitment, meaning that once the trial period has ended, there is absolutely no obligation to purchase the full product. However, users are only able to register for one trial account. Although the trial is limited in terms of the amount of time it can be used for, the service itself is completely unrestricted and unchanged. This means that customers are essentially given full access to the Cactus VPN service, for a period of 24 hours, with no unwanted additions, such as pop up advertising. There are no restrictions placed on either bandwidth or total data usage and all encryption methods are supported, giving users access to the SSTP, L2TP/IPSec, OpenVPN and PPTP protocols. Trial users are also able to access all VPN servers, including the Netherlands and Romanian servers, on which P2P and Torrent use is permitted. In addition, for the duration of their trial period, customers will be able to make use of the Cactus VPN Smart DNS and proxy services, and take advantage of the same level of customer support offered to paid subscribers. As with the full service, no logs of user activity are kept either, ensuring customers have full privacy. CactusVPN offers only some servers in three different countries, which are England, the Netherlands and the USA.